If you visit this page, you'll find two answers. 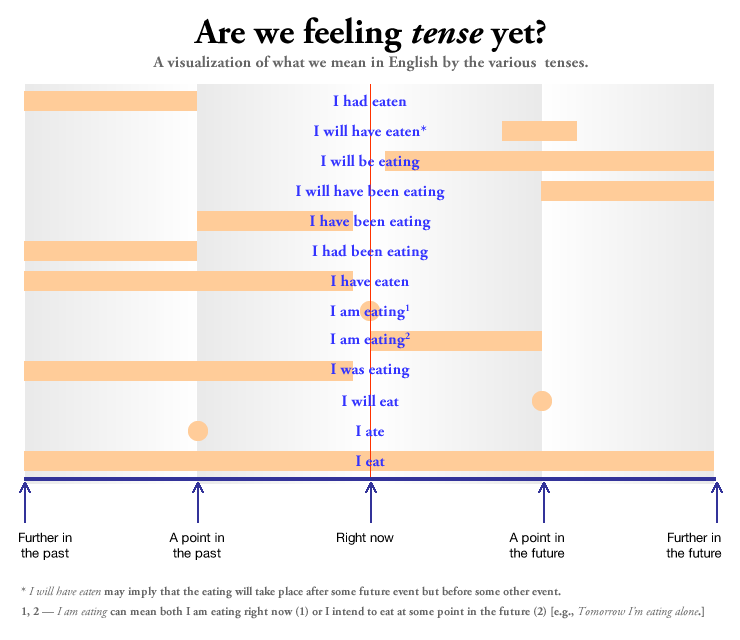 One is a diagrammatic representation of how the poster(s) view our mental representations of different verbal catenations or constructions relating to time in English. The second is a rough breakdown of what EFL teachers would call 'tenses', and how they're used. George Clooney asks his girlfriend to marry him, but she says no. I redecorate my house every twenty-five years. That's just off the top of my head. It is clear that far more detail and description would be needed to even partially address our usage of the present simple in relation to time. This answer post cannot be said to have comprehensively 'answered the question'. "glad to receive something" or "glad to have received something"? Simple Past vs. Present Perfect: "was" vs. "has been"
Which tense is more appropriate in the clause of this sentence, the simple past or present perfect? Not to refer to this question an being 'answered'( in the sense that all aspects of tense, aspect and time have been comprehensively addressed). Not to redirect people to this page unless they have specifically asked an absolutely identical question to this one. I would love to hear other users' opinions about whether it is useful to use this page in the way described, and also whether it is felt that reviewers should be able to redirect questions to this page as a comprehensive solve-all for questions about tense aspect and so forth. Ideally I'd like the community to prevent readers being redirected here from other answers altogether. (I'm have no qualms with people being directed here for addtional info, or as a related page containing pertinent content however). Non-native speakers often get confused about what the various tenses and aspects mean in English. With input from some of the folk here I've put together a diagram that I hope will provide some clarity on the matter. It's obviously not meant to be exhaustive or comprehensive; think of it as a mere palliative instead. We were getting (and still do) many, many questions asking about the simplest time expressions, over and over, and we undertook this "canonical" Q/A out of a sincere desire to help. As usual, no good deed goes unpunished. I originally wrote the question and answer (with the help of Kosmonaut, one of the original ELU mods and a linguistics grad student to boot) to help newcomers to English understand what we mean by some of the commonest expressions. Whether you're sincere or merely out to be snarky, or you have a linguistics cognoscente's axe to grind I cannot say. Nor do I care. It was not my idea nor ever my intention for this to be an easy wastebasket for junk questions, and if people use it for that I feel no guilt whatsoever. Many of those questions were single-vote-closed by moderators whose job description involves knowing the difference between a good question and a bad one anyway. In any case, of course you can come up with hundreds, perhaps thousands of other temporal nuances in English. If you ask such a question, and it's fresh or interesting for some other reason, I hardly think anyone will use this question to close it.